1. Adopt hardened metal shell,antistatic,preventing magnetic strong interference. 2. With 3mm thickness tempered glass as protection layer against the surface of LCD digital signage screen. 3. 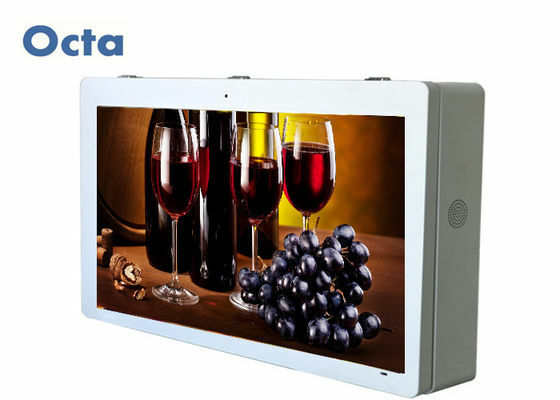 Adopt newest A+LCD screen,high contrast ration,high brightness,last longer and work better. 4. Optional for VGA Port, HDMI port.Compatible all formats. 5. Safely locking system to avoid flash memory card and advertising playing contents being taken away, also can beprotected by password. 6. Playing advertising program automatically and circular. 7. Build-in clock and calendar function in the system of player. requirements.Support 5 groups of auto power-on/off timer,able to set those 5 groups of time one day and 7 days in one week. we can offer you the complete solution, not only the hardware but also the software system. The machine with 3g/4g that can auto download content from internet for customer advertising that changes over night to different ads every day via network download. The bus lcd display come with 3g or 4g module for internet connection. Please notice that 3g and 4g module is different, please confirm which one you real need for 3g or 4g network. You only need prepare 3g or 4g SIM card(support WCDMA best), and then insert into 3g /4g module. Of course, you need ensure that the machine can connect with 3g/4g network. 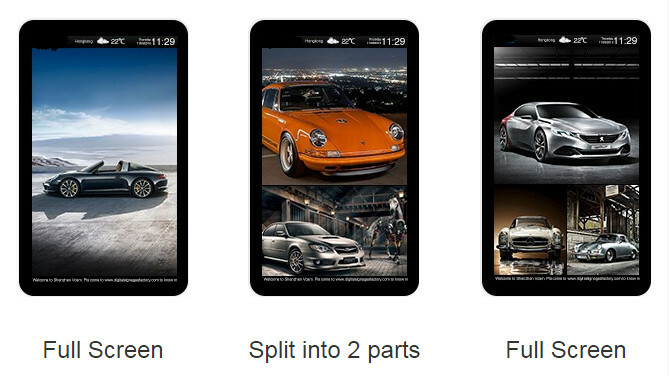 1), Quad core Cortex-A7 processor/1.5 Ghz, Android 4.4.2 Version system. 2), Based on B/S software management system structure. 3), Ad content update through 3g network. 4), Support playlist setting mode with different files at different times. 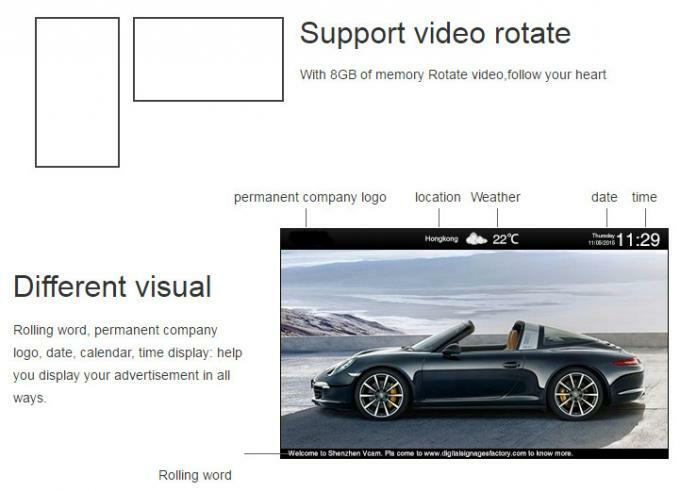 5), Support video+image+clock+scrolling text layout randomly. 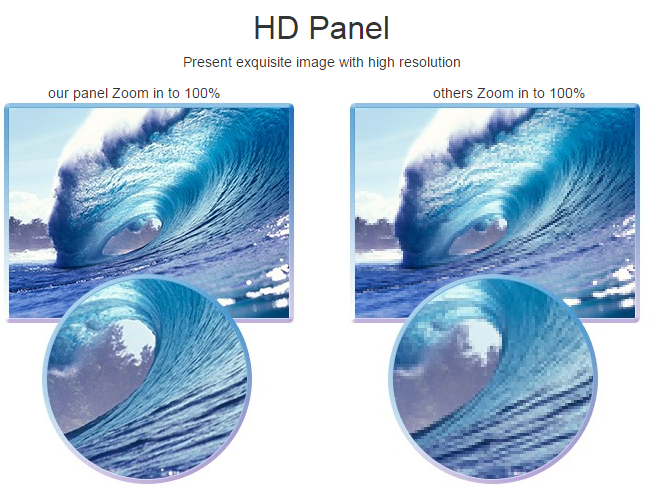 6), Support multiple Split-screen display and Cloud managing system. 7), Update/Check Player Content/Status Remotely at any time. 8), Support USB/Etherent/WIFI(802.11b/g/n)/3g network update information.